Sunday, May 22, 11 AM – Noon FREE ! Sunday, May 22 will be the kick off event for the 2011 season. Bring your homegrown fruit, vegetables, eggs, herbs, honey, flowers, seeds, & plant seedlings! 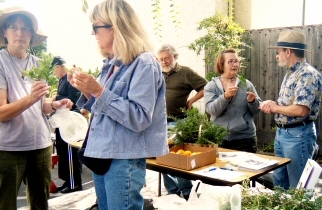 Throughout the Bay Area, neighbors are coming together for sharing locally grown, fresh produce. Our Palo Alto sharing event is supported by a coalition of community ecological organizations and neighborhood groups including: Acterra, Barron Park Green Team, Barron Park Garden Network, Barron Park Assn., Common Ground Garden Supply & Education Center, City of Palo Alto Community Gardens, Slow Food South Bay, and Transition Palo Alto. This entry was posted in Events, Food, Garden, Local by Paul Heft. Bookmark the permalink.